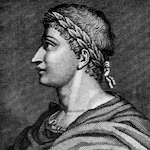 Publius Ovidius Naso (43 BCE - CE 17), a Roman poet known as Ovid, is ranked alongside Virgil and Horace as one of the three canonical poets of ancient literature. His poetry had a significant influence on European art and literature for centuries. FCIT. "Ovid author page." Lit2Go ETC. Web. 20 April 2019. <https://etc.usf.edu/lit2go/authors/61/ovid/>. FCIT, "Ovid author page." Accessed April 20, 2019. https://etc.usf.edu/lit2go/authors/61/ovid/.